2018 we made a lot of great friends via the internet (isn’t that how many of us are making friends these days, ha). Before the New Year, we caught up with one of those relationships, the amazing Romelia Ramos. A Mexico-born lifestyle blogger now residing in Denver, Colorado who shares all things motherhood and loves the important of bilingual parenting with her husband/high school sweetheart. 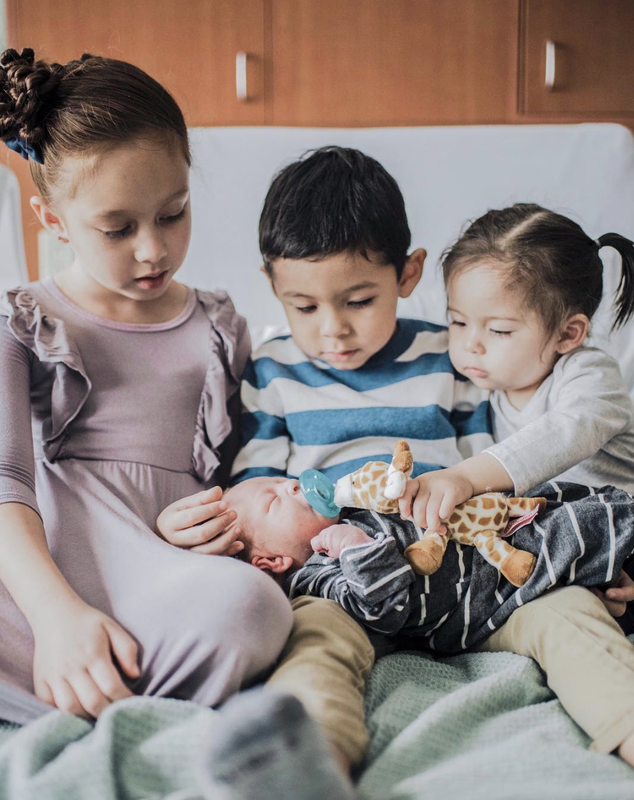 Read more as you get to kmow Romelia’s perspective as a 4th time mama and the hardships, but also rewards, of how she’s experiencing motherhood today. You can find Romelia on Instagram or her blog! Tell Us About Yourself — Who you are, where you’re from, what you do? I am Romelia, mama to three littles plus one on the way that will complete out family of 6. I was born in Mexico but raised in the US, with no brothers or sisters — which shortly made me realize that I wanted a big family of my own some day. I am currently a SAHM (stay-at-home-mom) turned blogger + influencer. I decided to try out something new to help ease the hardships that come with parenting and share my journey as a young mom with others in similar positions as myself. I have found that there are so many of us going through the same things everyday and it’s so nice to be able to connect and share our experiences because that enables us to understand that we are not alone, we are a community! So you’re getting ready for your 4th child — What’s that been like? Let me take a deep breath for this one. Seriously. I would say it’s been such an interesting journey, full of beautiful, rewarding, & exhausting experiences that have left me to wonder how the heck I’m still on both feet. Don’t get me wrong, I absolutely love my growing family and always pictured myself with four kids, but let me clarify, it is easier said than done. Ha! There are moments when I feel like I actually know what I’m doing, things are going super smooth and I should probably be nominated mom of the year. Then, there are days where I’m trying to keep three kids contained in one area while looking for my phone and keys, then realizing I’m talking to my husband the whole time and holding the keys with my other hand. But other then that it’s the best thing that has ever happened to me. Think back to your first pregnancy, what were some things you didn’t expect as a first time mama? Definitely the lost of communication between friends. And the real world. Also, the value I had for sleep and me time grew from 10 to 100. As a first time mama, my main focus was my daughter but I also missed my daily dose of socializing and catching up with friends. How do you deal with unwarranted advice about raising your children? As a young mom, I think I have experienced this so much that it kind of became a norm for me to hear it from people. I always knew what I wanted to instill in my children and the way I wanted to raise them, so I guess for me it wasn’t too hard to just stop and listen but not soak. Never in a rude way, but always letting others know exactly what we do and what things work for us has helped. I feel like others might hold their thoughts and opinions if you show them how strong your barrier is when it comes to raising your children. Of course, there will always be someone out there that has the “best” advice. What do you find is the most difficult thing about adjusting a new child into the family and daily routine? I would say the most difficult thing about adjusting is time management and balance. As our family grew over time, I realized that a routine is the key to trying to stay organized and have things move along smoothly. Although this is another one that is easier said then done; it’s important to be able to learn to develop a strong balance between everything that is going on. From spending quality time with each of my kids, to prioritizing date night once in a while even if it’s in our living room. What’s the best thing about adjusting a new child into the family and daily routine? You might think I’m nuts but, I love our busy days and the loud crazy mornings we start off too. It’s just a reminder to me that although I might be loosing my head most of the time, all of this will soon pass. Our children will grow up and leave our nest before we know it, so watching them grow up together and share their sibling bond is the best part of all. In the mean time, I will probably continue to be late for everything. When you have a night-off (if you do), what can we catch you doing? Probably being a couch potato with my husband talking about our kids and what crazy things they did that day. As I mentioned above, I am a SAHM M-F so my husband loves hearing all about our day. Sometimes if I’m lucky enough, I will head out to target by myself and walk the isles pretending like I’m actually looking for something. What are some things you are passionate about when it comes to parenting? Becoming a parent has taught me so much about myself and my passions as a mom. I love to be super hands-on with my family and create memories together by doing things we love. I like to go all out during holidays, special days, birthdays and mostly everything. It makes me so happy (and emotional) to see that magical sparkle in their eyes. I am also super passionate about teaching my kids to love, encourage, support and inspire each other. What's One Piece of Advice You'd Give to a Mama-to-be? Mom Life is hard — take it easy on yourself and give yourself time and space. Taking care of your needs those first few months is so essential to your well being, always accept help when it’s being offered. The newborn stage will go by so quickly leaving you to always have a love hate relationship with time. What’s something you’re looking forward to in the New Year? This New Year is a big one for us, first off — we are closing a chapter in our lives that we will never experience again. Being pregnant. (yes I’m totally crying right now) know that our family will be complete as a party of 6 is so fulfilling yet emotional but we are so ready to continue making memories and move on to big kid things, although my babies will always be my babies. We are also making some big steps to accomplish some major goals we have set and hope to be heading on the right track to get there. All in all, I look forward to all the quality and family time we will spend— all the new things we will do and memories to make.